If the winners could email us their address we will ship the books out asap. 3ds Max is a uniquely powerful modelling program, yet one that can catch out both new comers and even advanced users out with its intricacies and workflows. Many tutorial style books are fundamentally flawed by assuming the reader is already familiar with various aspects of the software. Indeed, we remember well a book that stated ‘now complete this easy step’ only to leave us both frustrated and annoyed as we failed to grasp the instructions. 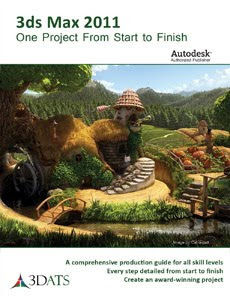 What therefore is needed is a book that illustrates the process of creating a 3D visualization project step by step – and we are pleased to say there finally is a book worthy of its title ‘3ds Max 2011, One Project from Start to Finish’. The book has been designed to be useful for readers at all skill levels. The material is presented in a way that will engage advanced users while still being explicatory enough for beginners – which is great to see. Covering 2D-3D Modelling, Terrain Creation, Tree Creation, Water Elements, Animation, Lighting, Rending, Particles Systems and more the book provides a fully structured guide. If your only going to buy one 3D modelling book this year then 3ds Max 2011 – One Project from Start to Finish is simply the best option. The publishers 3DATS have kindly provided us with 3 copies to give away to readers – simply retweet this post and we will pick 3 winners at random from the Twitter feed. Competition ends 28th February, so you have a week to enter. The retweet button is at the top of the post, good luck, books will be shipped Tuesday 29th, each valued at $99.95.